Alternative names : LIXUS OXYS 50 MG.
LIXUS Oxy Tabs are considered to be the most powerful steroid commercially available. A steroid novice experimenting with LIXUS Oxy Tabs is likely to gain 20 - 30lbs of massive bulk and it can often be accomplished in 6 weeks time. LIXUS Oxy tabs however produces water retention so a good portion of this weight will be water weight however this might not be significant to you as you will look big and strong. The benefit is that this smooth muscle can add to the size and strength gained. Your muscle is fuller, will contract better and you get protection in the form of the extra water added. This will allow for more elasticity and will hopefully decrease the chance for injury when lifting heavy. It should also however be noted to go careful and not place too much strain on your connective tissues as you do not want to tear your pectoral or biceps tissues as there can be such a thing as gaining too fast. LIXUS Oxy tabs are immensely popular with strength athletes who don?t have to worry about weight classes (Field athletes and strongmen), and with power lifters in the heavier weight brackets. 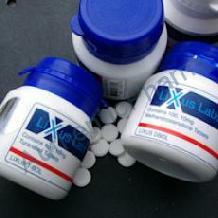 LIXUS Oxy tubs contain 100 tablets containing 50MG of Oxymetholone. LIXUS Oxy tabs 50MG dosage is 50 - 100MG per day for no longer than 6 - 8 weeks to minimize hepatotoxicity. At this level you will see very dramatic increases in muscle mass and strength. I would not recommend that you exceed this dose due to the strong estrogenic nature of LIXUS Oxy Tabs. LIXUS Oxy tabs can be combined with other LIXUS Injectable Steroids for some amazing gains. A stack of 300MG LIXUS Deca and 300MG LIXUS Testosterone enanthate would produce gains of a mammoth proportion and is geared strictly towards strongmen. If you are looking to add something to counter balance the estrogen related side effects you could incorporate some LIXUS Masteron, alternatively LIXUS Equipoise would give some amazing gains as well. I would strongly advice however that you do not combine LIXUS Oxy with any other oral steroid due to the strain on the liver.